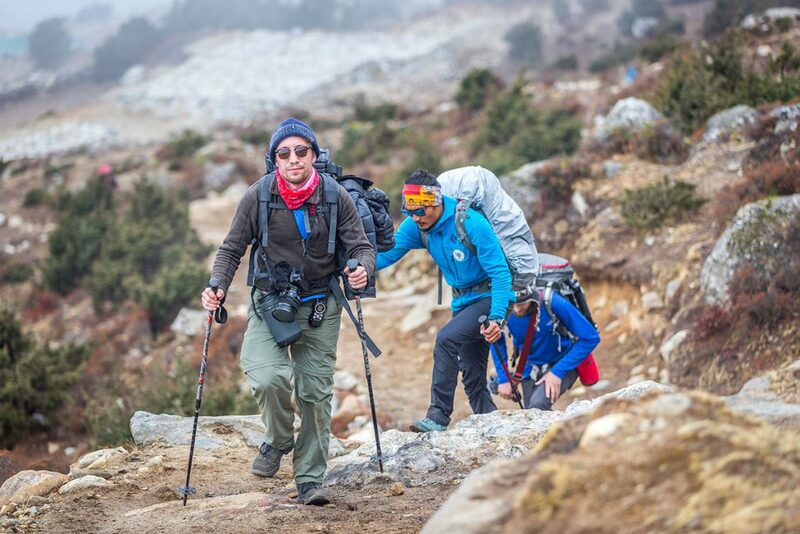 Want to learn more about Trekking to Everest Base Camp, the most classic trek? Contact us today and we will give you all the info you need. This is the classic Himalayan Trek and travels directly through some of the most famous mountain terrain in the world. Our goal will be to reach the site of Everest Base Camp located at an altitude of over 17,000 feet. Along the way, we will trek through famous Sherpa villages and take in some of the most breathtaking views on the planet. We will fly from Kathmandu to the small village of Lukla, where we load our gear onto yaks and meet some of our local staff and begin the trek. We will visit the Sherpa capital village of Namche Bazaar. 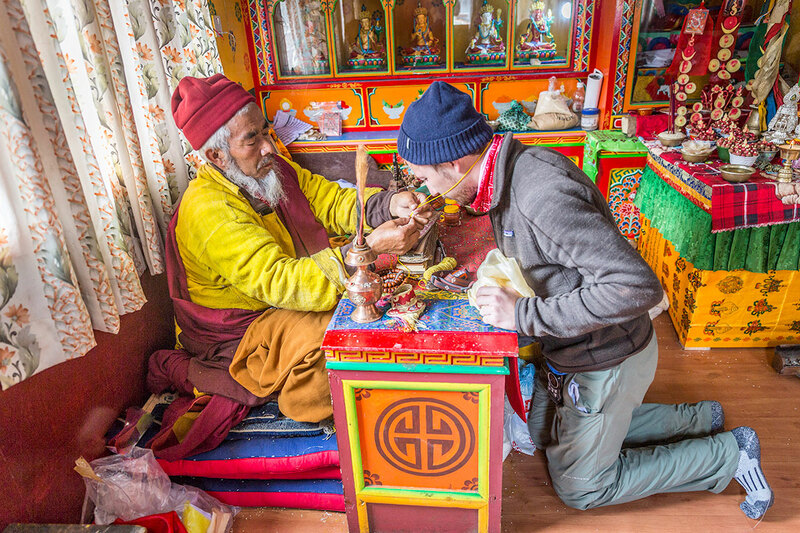 Visit the high Buddhist temple in Tengboche and take in views of some of the most famous mountains in the world such as Ama Dablam, Everest, and Lhotse. Once we reach the Everest Base Camp, we spend the night at the base of the world’s most famous mountain and take in the amazing scenery. While sleeping at the foot of the Khumbu Ice Fall, we will likely meet mountaineers from around the world staging their attempt of Mount Everest. We will take a day hike to the lookout point atop Kala Pattar (17,000) one of the most famous trekking peaks in the world. The Everest Base Camp Trek is a non-technical walk through amazing mountain scenery. We will take a great deal of care in acclimatizing our bodies to the extreme altitude. Even though this is a non-technical trek suitable for beginner and experienced alike, we will manage the schedule very carefully and utilize our staffs local knowledge to deliver the safest and most encompassing cultural experience available. Our Mountain Professionals staff have led numerous expeditions to this area and are veterans of Everest climbing expeditions. Your guide is likely to be an Everest summiter. Day 1: Arrive at Kathmandu International Airport. Our team transports to our hotel the Yak and Yeti in the Thamel region of Kathmandu. Day 2: Rest and relax in Kathmandu, take a walk to the many Temples, Stupas or other attractions. Day 3: Here we will take an internal flight from Kathmandu Airport to the village of Lukla at 9,350 feet and continue on to Phakding at 8,700 feet. Day 4: Today we hike to the Sherpa village of Namche Bazaar and visit the capital city of the Sherpa people. You can spend your day exploring the many attractions in Namche or just relax at 11,300 feet. Day 5: Today we take a rest day and acclimatize in Namche Bazaar. 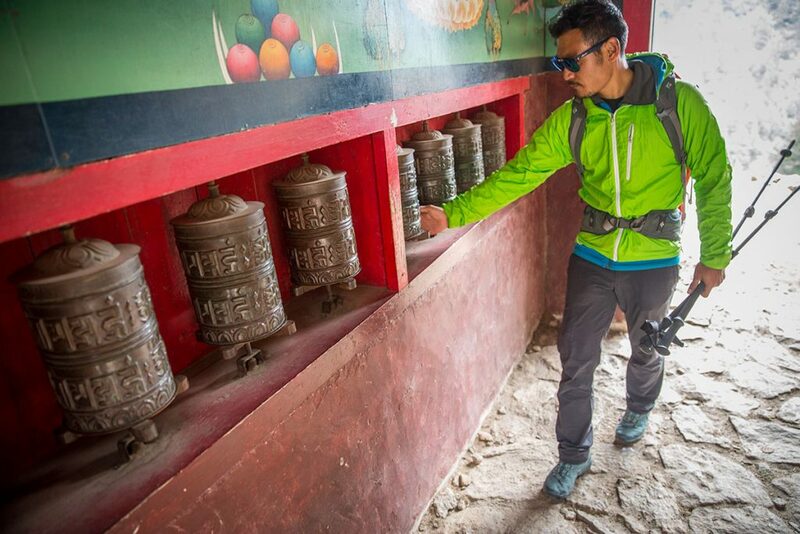 We can visit the Sherpa Museum or take a breathtaking day hike. It is possible to take in views of Everest, Lhotse and Ama Dablam on a short day hike. Day 6: We will hike along the Dodh Kosi river and eventually make our way through high Rhododendrons to the Tengboche Monastery. We continue to Deboche village. Day 7: Today we hike to Dingboche at 14,000 feet and with amazing views of Ama Dablam. Day 8: We will likely take a rest and acclimatization day here to ensure good health and visit with the local Sherpas. Day 9: The trail becomes interesting here and we trek our way up to the high village of Dzugla located at approximately 15,000 feet. Day 10: We walk along the Buddhist Mani Stones and climbing memorials to the small village of Lobuche, 16,000 feet. Day 11: If weather permits we trek to the top of Kala Pattar for stunning views of Everest, tonight we sleep in Gorak Shep, 17,000 feet. Day 12: We make our way along the moraines of the Khumbu Valley and reach our goal of Everest Base Camp, 17,500 feet. Day 13: We spend this day relaxing in Everest Base Camp. Day 14: Hike out to Periche at 13,900 feet. Sleep in Periche. Day 15: Hike to Namche Bazaar. Day 16: Hike to Lukla and spend our last evening visiting our new Sherpa friends. Day 17: Fly from Lukla to Kathmandu, Celebration dinner and hotel. Day 18: Transport provided to Airport. Transfer from Kathmandu International Airport to and from hotel. 3 Nights accommodation in Kathmandu at the Yak and Yeti Hotel. Transfer to and from Lukla via internal flight. All tea house accommodation costs. Sherpa guide, assistant guides, porters and cooks. All meals and during trek. Camping equipment including tents, tables, and chairs at Everest Base Camp. Yaks and porters for group and personal gear. Items of personal nature, individual travel costs, delays, taxis, etc. Meals while in Kathmandu, outside of welcome dinner. Alcoholic drinks and personal snacks.